Oh, man, this one is a 'six'! At the beginning of the year, I decided to get serious about testing whether or not sage could tame hot flashes. Why? To see if there is a safe, effective, plant-based alternative to taking hormones (and because I've been sweating non-stop for 7 straight years). I have therefore been monitoring my hot flashes day and night for 3 months now. For the first 2 months, I noted both the intensity and duration of every hot flash. After seeing that intensity followed duration hand in hand unwaveringly, I stopped noting duration (why you will only see one column of numbers in the notebook on the right). As for the results so far, they've surprised even me. I haven't tallied all the figures yet (still gathering info), but here is a peek at 2 of my notebooks. 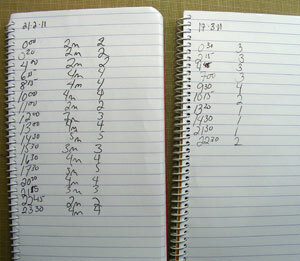 The notebook on the left is a typical day with no sage (17 hot flashes – average intensity: 3,3). The notebook on the right, a typical day with sage (10 hot flashes – average intensity: 2,3). Explanation: the lower the number, the milder the flash. For more details of this scale, please visit this earlier article. Are You a Hot Mama Too? I'd like to establish whether or not I am the only person sage has this effect on. Are you experiencing hot flashes and taking no hormones or other products for them? Are you in Denmark? (Sorry non-Danish hot mamas, proximity is an issue this time around). 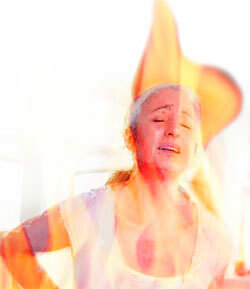 Are you willing to monitor your hot flashes around the clock for a period of time? Are you willing to try a brand new, plant-based product that has so far only been tested by 1 person? If so, then please send me an email here and write 'Hot Mama' in the subject line. If you would like to read a bit more about why I have focused on sage for hot flashes, please see this article. Du skriver simpelthen så godt. Det er så spændende og inspirerende at læse din blog. Ih tak Anna! Man er altid glad for ros! !